Hunan refers to a regional Chinese cuisine featuring spicy dishes with sweet-and-sour flavours. Mix first 4 ingredients; set aside. Heat 1 Tbsp. oil in wok or large skillet on high heat. Add eggplant; stir-fry 1 min. Cover; cook on medium-high heat 2 min. or until eggplant is evenly browned, stirring occasionally. Remove from wok; cover to keep warm. Add remaining oil to wok; heat on high heat. Add peppers, ginger and garlic; stir-fry 30 sec. Add meat; stir-fry 5 to 6 min. or until done. Stir in eggplant and dressing mixture; bring to boil on medium-high heat, stirring frequently. Spoon onto platter; top with coriander. 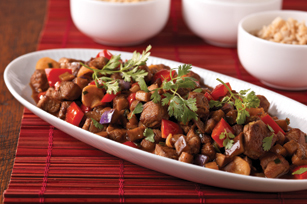 Omit Chinese eggplant, decrease oil to 1 Tbsp., use 2 chopped red peppers and omit the second recipe preparation step.